MDC-Alliance says it will this year embark on mass action to remove President Mnangagwa and his Government from power in order to effect the regime change agenda bankrolled by some Western nations. The party's deputy treasurer Mr Charlton Hwende yesterday sensationally claimed on his Twitter handle that his party will this year, roll out mass action against President Mnangagwa. The development confirms reports by The Herald last week that the opposition is working with local non-governmental organisations and some Western countries to unseat the constitutionally elected Government. "2019 is the year of rolling mass action against the illegal regime of @edmnangagwa," said Hwende. "We voted for @nelsonchamisa and we must be prepared like the thousands of gallant Liberation struggle heroes to die defending our right to choose the President of our Choice #2019ChamisamuOffice." The Herald reported that six Western nationals have been working with local non-governmental organisations to fight what they claim is "a crisis of legitimacy" following President Mnangagwa's victory in the July 30 harmonised elections. Six foreigners, some of whom have already been identified, reportedly convened a week-long workshop at a private lodge in Harare earlier this month. They came up with strategies to incite Zimbabweans to revolt against President Mnangagwa and the Zanu-PF Government to force a unity Government with opposition political parties or to set up a transitional authority. The workshop was reportedly coordinated by Crisis Coalition in Zimbabwe chairperson Mr Rashid Mahiya and a committee member, Mr Pride Mukono and ran from December 3 to 7 under the theme: "The Crisis of Legitimacy in Zimbabwe." More than 80 people drawn from 40 civil society organisations affiliated to the Crisis Coalition in Zimbabwe attended the workshop. The six regime change strategists from the United States, Germany, Spain and Switzerland facilitated the workshop at which the NGOs were assured of more funding if they displayed maturity in organising their programmes as one entity. The foreigners who attended the meeting included Ms Nora Rafaeil, an American, Gerald Ordway (Spain) and Martina Zapf (Switzerland) while delegates who attended the workshop were drawn from various civil society organisations known to be aligned to the MDC- Alliance. 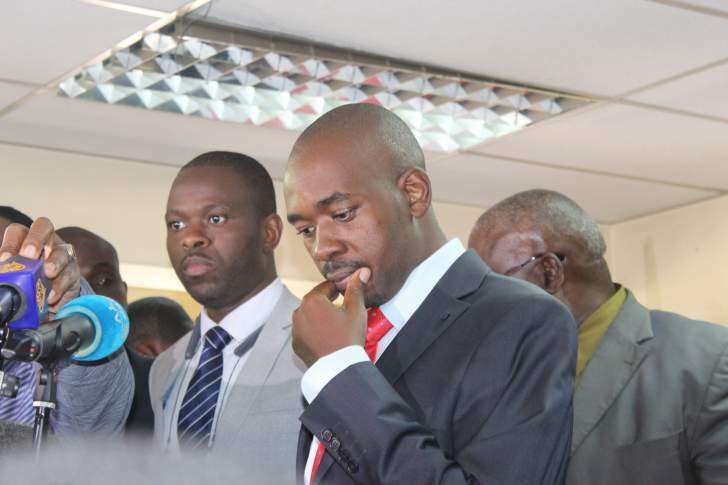 The workshop claimed that the elections which saw President Mnangagwa thumping his main challenger, MDC Alliance's Nelson Chamisa, and Zanu-PF winning the parliamentary polls by a two thirds majority, were rigged. Mr Chamisa rejected the election results and took the matter to the Constitutional Court where the application was thrown out with costs for lack of merit. The rigging claims are despite overwhelming endorsement of the elections by all credible observers except those from the West who have maintained sanctions on Zimbabwe since the turn of the millennium over its land reform. The workshop adopted resolutions to bring "civil society under one tent" to address the so-called legitimacy crisis and to organise protests like what happened in 2007 under the "Save Zimbabwe Campaign" which turned violent. However, some twitter handlers dismissed Hwende statement as hogwash and accused him and his party of being part of Western dummies. One Kubvara tweeted: "The reason why MDC will never take office in this country is because they are not nationalistic in nature. They are western surrogates who do not even share same views with the rural folk. Ask Trump anokuudzai Chokwadi (Ask Trump he'll tell you the truth)." Another twitter user only identified as Ralph said Hwende's twitter handle confirmed reports that his party was working with foreigners to push for regime change agenda. "Don't you by any chance think you are strongly enforcing the story which said there were six agents from EU (European Union) to assist in the subversion of the current regime riding on the same strong statement of illegitimacy and all? Munenge murikushanda nevekunze zveshuwa mkoma (It seems like you are working with external forces my brother)," said Ralph answering to Hwende's utterances. Said Zim/Tartan Terror: "The most corrupt thing is the MDC backing sanctions, sanctions don't affect the rich it's the ordinary people in the street in Zimbabwe that suffer, voters from all parties, MDC voters included."